One of the most important things in the early life of a child is good nutrition. Regardless of where you stand in the breastfeeding VS formula debate, you certainly don’t want to feed your baby with dangerous chemicals. Surprisingly, that harmless apple juice box may not be so harmless after all. Some of our everyday groceries may be hiding dangerous chemical elements. Even baby food jars need to be carefully selected. Here is a list of three chemicals to be aware of when buying your baby food. Lead exposure during childhood is linked to lower IQ development in adults. On top of that, it may also cause a variety of behavioral problems. In an alarming report published in the Environmental Defense Fund (EDF), the researchers found some rather interesting results. 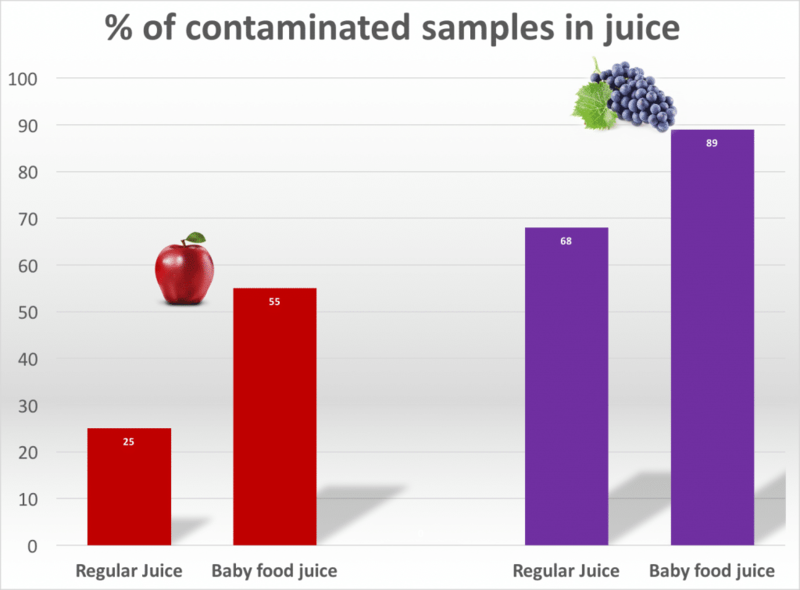 It turns out that baby food showed a higher percentage of contaminated samples than regular food. The EDF research has gone through 11 years of federal data to find that 20 percent of all baby food samples had detectable levels of lead. This is an alarming result, given that there are no safe levels of lead in the blood. Some types of baby food had detectable levels of lead in more than 40 percent of all the samples. Feeding your baby with that mushy baby food may be convenient, easy for your little one to digest and yummy. However, it may actually contain dangerous pesticides as this report from Environmental Working Group (EWG) revealed. The study identified as many as 16 different pesticides when testing 8 leading brands of baby foods. For these tests, the EWG used standard pesticide analytical methods from the Food and Drug Association (FDA). Another study done by Consumer Reports found measurable levels of arsenic in rice baby cereal. Arsenic is a dangerous carcinogen commonly found in grocery products made with rice. The study from Consumer Reports revealed that rice cereals showed levels of arsenic at least five times higher than in alternative cereals like oatmeal. In conclusion, the study suggests that parents should limit the consumption of rice products. BPA is a dangerous chemical used to make plastic. Studies in other animals have linked it to cancer and early puberty. Adults with high levels of BPA in their urine have higher risk of developing a series of metabolic diseases. The main risk of exposure to BPA for infants come from baby bottles, food containers and a variety of baby toys. Even some of the plastic substitutes are almost equally as toxic. When buying food containers or baby toys, make sure that the material is BPA free. Baby food jars made of glass are also a better choice than plastic, but make sure that lids and seals do not contain BPA. How to Avoid Dangerous Chemicals? As careful parents, what is our best course of action? 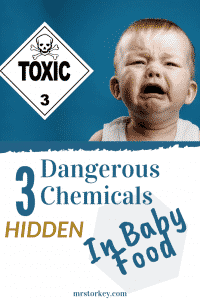 How do we make sure our children are not exposed to these and many other dangerous chemicals? Our best bet is to consume locally and give preference to 100% organic products. But perhaps the most critical habit one needs to develop is to read labels. Take interest in what you are buying to your household. Educate yourself and act on it. In addition, it is our job to contact local authorities and demand more comprehensive and clear food regulations. It is only by being proactive that we are going to guarantee the safety of our loved ones and ourselves.